With scientifically proven immune enhancing properties, this bio-fermented probiotic elixir is the ideal tonic if you’re recovering from illness, have tired, sallow-looking skin or want to help protect your skin from environmental assault. Rich in papaya to help combat free radical damage and boost gut health, this clever concoction helps to protect your skin from cellular ageing, boost your immune system and nourish your gut microbiome – and all you have to do is drink it! Like drinkable skin care, this beauty-boosting, bio-fermented probiotic elixir has been scientifically formulated by The Beauty Chef to put up a fierce fight against free radicals and boost your immune system. Helping to protect your skin from cellular ageing, this probiotic concentrate contains potent antioxidants papaya leaf, pomegranate, green tea and vitamin E to fight free radicals and repair damaged cells. Alongside this, pomegranate and vitamins A, C and E stimulate cellular renewal for plumped, radiant skin and each serving provides a whopping six billion probiotics to promote a healthy gut balance and boost the immune system. The potency of all the ingredients have been enhanced by The Beauty Chef’s exclusive Flora Culture fermentation process, which makes the nutrients more bio-available and better absorbed by the body’s cells. Better still, this is free from artificial colours, sugar and gluten and is suitable for vegans. All in all, a great way to supercharge your skin care routine! 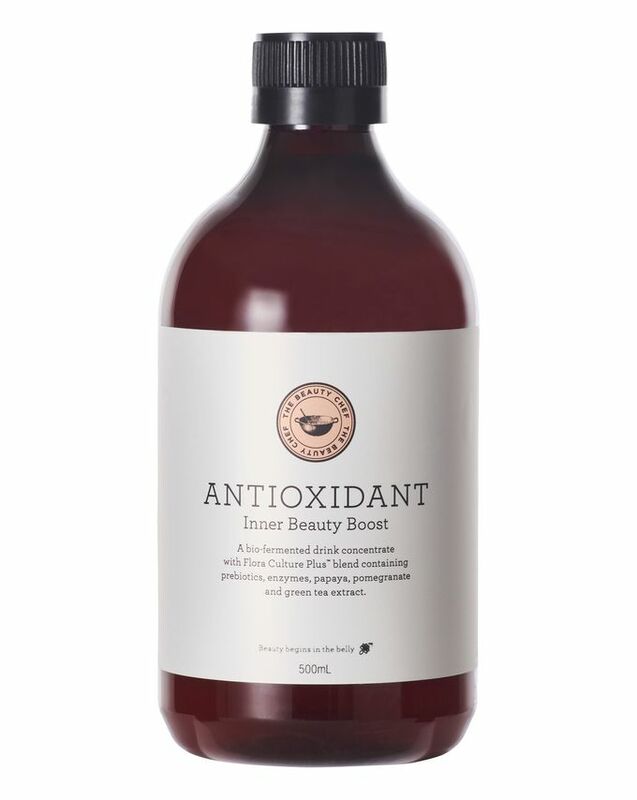 Or simply mix a 15ml serve of the Antioxidant Inner Beauty Boost with 200ml of filtered water and consume once daily. I am in love with this drinkable beauty injection. Tastes great and my body thanks me. I'll rebuy again and again.